We've tested and picked out the best H.265 decoder software here. Scroll down to dig out more details on HEVC decoding and free download the fastest HEVC decoder to transcode HEVC/H.265 to H.264 or MP4, whether you are going to play HEVC on VLC Media Player, QuickTime Player, iPhone iPad, Android Windows mobile phones and tables, TVs, or edit it in Adobe Premiere Pro, Final Cut Pro, or for other uses. HEVC (High Efficiency Video Coding) featuring better quality and much smaller file size has soared in popularity. However, there are times when you have to decode HEVC to MP4 H.264/MPEG4 or other popular formats since many mobile devices, video editors and media players don't support HEVC codec. There are many reported errors during H.265 playback, for example, "I tried the latest version of VLC, MPC, Potplayer to no avail. My players can smoothly play 1080p videos but sadly not the 1080p HEVC files. Is there any free HEVC decoder available?" Unluckily, it's not easy to decode HEVC video files. Currently, there are two ways to ensure smoothly HEVC playback - HEVC software decoder and hardware decoder. The former is flexible and supports a wide range of media formats. Any computer can decode H.265 with the aid of H.265 codec decoding software. But decoding HEVC using software consumes more CPU power. • Apple iPhone, iPad, Apple TV, Mac supporting iOS 11 and macOS High Sierra. • GoPro Hero6 Black action camera with 4K60p HEVC video encoding. However, some graphic cards (AMD) have issues with 4K HEVC codec decoding, like messed images, broken outputs, etc. And if it's not working on HEVC hardware decoding, you have to turn to the HEVC decoding software for help. The most popular HEVC/H.265 decoding freeware includes Handbrake and FFmpeg. 1. Programs might chock on decoding 4K UHD HEVC videos or crash quite often, and the CPU usage spikes to 100%. 2. The loading time can be lengthy and the output video quality can be in a mess. 3. Even the most popular freeware HEVC decoder Handbrake is facing problems when processing 4K HEVC/H.265 decoding - it's very slow, only about 4 frames/sec though quick sync is enabled (4K UHD HEVC video decoding speed varies between computers). 4. Some HEVC hardware decoders manage to transcode the HEVC video but the outputs are choppy and unwatchable on VLC. Free HEVC decoder Handbrake isn't the best option considering its slow and relatively disappointing performance. So what's the best HEVC/H.265 converter & decoder that can make the whole process more efficient? 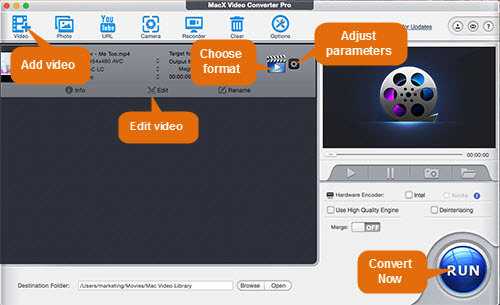 MacX Video Converter Pro was and still is the best bet. Fast speed - It's the fastest H.265/HEVC processing tool that can load 4K UHD HEVC files in seconds and decode HEVC/H.265 at 5x faster speed than Handbrake, thanks to its hardware acceleration tech. No worries about chocking or crashing. Low CPU usage - The improved decoding algorithm for HEVC codec helps the software give the biggest performance boost yet with the lowest CPU usage. The HEVC/H.265 decoding won't affect other apps running on the same host. Decode HEVC to any format - It fully supports decoding 4K UHD H.265 to H.264, MPEG4, MP4, MOV, AVI, MKV, etc for better compatibility with your players, mobile devices, TVs, gaming systems, etc without any stuttering. HEVC encoder - It works as an HEVC encoder that enables you to transcode videos of H.264, VP9, MPEG4, MKV, etc. to HEVC/H.265 without any hassle. High quality - Its embedded High Quality Engine guarantees nearly no quality loss during decoding. Support both Mac and Windows - It is available for Windows and Mac, with the latest Windows 10 and macOS Sierra supported. With well-designed UI, the HEVC decoder is very easy to use. Before you get started, download the 4k HEVC video decoder for Windows or for Mac, run it, and follow steps below to decode HEVC to H.264 MP4 or other format for playing on media players, mobile phones, gaming systems, etc, or for other uses. Step 1: Drag and drop HEVC files to load HEVC videos you'd like to decode, or click "Video" on the top-left corner of the window and select HEVC files from computer. Step 2: Choose output format. Output Profile window will pop up after loading HEVC files, allowing you to select output format. Then click "Done" to save the output format settings. 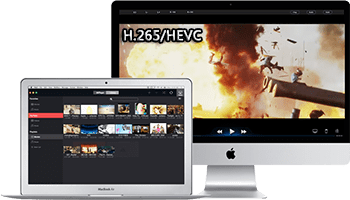 The H.265 video converter has 370+ video and audio codecs built in and enables you to convert MKV H.265/HEVC to MP4 H.264, MPEG-4, AVC, AVI DivX and many other video codecs formats. The built-in 410+ preset profiles ready your HEVC videos to be transcoded for your iPhone, iPad, Android Windows Microsoft mobile phones or tablets with one-step HEVC/H.265 decoding process. The HEVC 4K UHD decoder can works as a 4K HEVC video editor, which is quite useful for advanced users. Click "Edit" icon to further editing HEVC before processing decoding, like trimming, cropping, adding watermark/subtitles. Besides, it is possible for the HEVC video decoder to merge separate HEVC footages, clips into one, or split large HEVC files to several parts. You can click settings to adjust HEVC video audio parameters, for example, video resolution, video audio bit rate, frame rate, audio channels, and more. Step 3: Click "RUN" to start processing HEVC on your computer. The HEVC decoder also works as a HEVC encoder, enabling users to easily encode videos of AVC, MPEG-4, VP9, VP8, h.264 to H.265. Free download the No.1 fast H265/HEVC video converter to quickly decode H265 (HEVC) to MP4 in H.264/MPEG-4/AVC on Windows and macOS. It also supports you to convert any video to MP4, MKV, MOV, AVI, FLV, WMV, MPEG, VP9, etc. 200+ video audio formats.